I was accused of being a philistine when I showed a lack of enthusiasm to go and see The King’s Speech at the QFT – obviously a film about a king learning to conquer his stutter. Not much of a story? Wrong. Colin First and Helena Bonham Carter the most regal couple as they play Prince Albert and his wife Elizabeth. Older brother Prince Edward will inherit the throne when King George V dies. But his relationship with Wallis Simpson complicates matters. Behind his back, Albert’s wife Elizabeth seeks out Antipodean speech therapist Lionel Logue, played by Geoffrey Rush in an almost Michael Caine-esque fashion, and asks if he will take on a new client. At first, Albert is reluctant to embrace the unusual methods. But the film follows the journey of “Bertie” and Lionel’s strengthening friendship. Their relationship is beautifully balanced, with the two men equally stubborn as they make progress and negotiate around setbacks. The film reaches it’s historic crisis point when Edward abdicates leaving his tongue-tied brother to take over as King. Unable to speak in public without long hesitations and enormous effort, and yet aware of the need for the monarch to communicate with their subjects, how would Prince Albert step up to become King George VI (as he was to become known) as war threatens? With a keen sense of the expected role and behaviour of the Royal Family, it seems like an impossible task. It’s an extremely well crafted film, with unusual point-of-view shots looking into rooms from the perspective of an apprehensive Prince Albert. The balance in Lionel and Bertie’s relationship is mirrored in the symmetry of the shots as they talk during their sessions. The humour is gentle – and the swearing scene is quite charming. At times the film’s soundtrack seems to mirror Prince Albert’s stutter, with a long hesitation at the start of the film before the sound kicks in. I’d strongly recommend The Kings Speech. Once again it felt a shame that three years of history at secondary school had covered Neolithic man, Oliver Cromwell and the build up to World War One, yet had skipped over a royal soap opera that led into World War Two. Mark Logue has released a biography of his grandfather to tie in with the film, based on diaries and archive material. 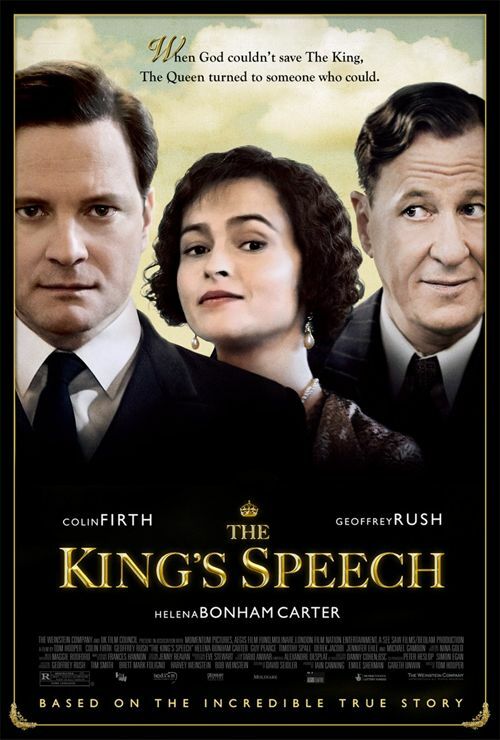 You can catch The King’s Speech at the QFT until Thursday of the week. Also playing at other local cinemas. Surely a biography of his grandfather, no? Oops - slip of the parsnips. You certainly are a philistine, but not in the way that you think. The phrase *spoiler alert* is usually used before this type of article. What is the point in re-telling the story anyway? The penguin story is really the only spoiler in there. The rest is just the historic framework. What I haven't told you is how the relationship develops, the family tensions, the tests for his technique ... and that's what the film's actually about. As I suggested to my wife ... obviously a film about a king learning to conquer his stutter ... but it's not. I agree, the film is charming, probably best displayed in its development of the friendship between the two main characters. Perfectly cast in those two instances. Well worth a watch.